I had to post this recipe since most of us are going pumpkin patchin’ and carving pumpkins in preparation for Halloween. 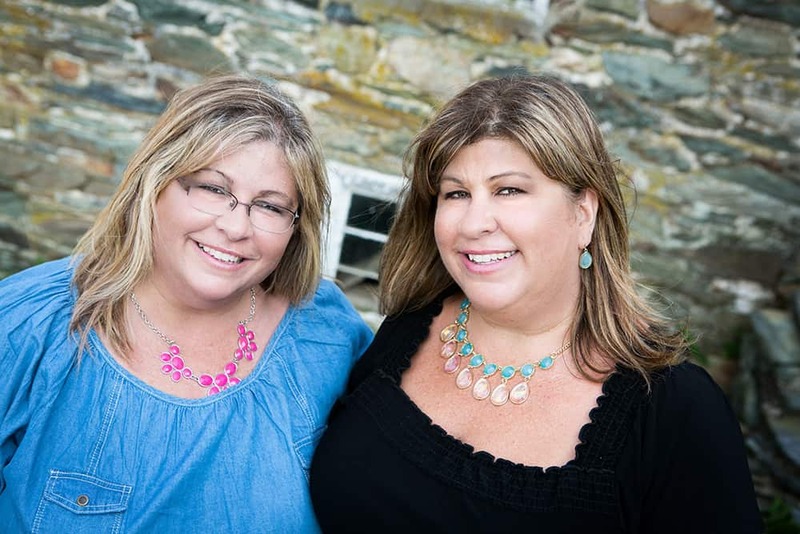 Ever since Terri and I were kids, we’ve always looked forward to not only carving our pumpkins, but also our Mom scooping the seeds out and roasting them in the oven. 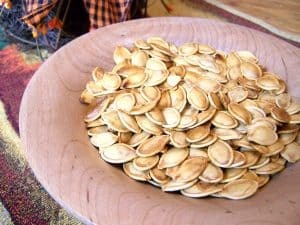 I have many memories of getting dressed in my Halloween costume and smelling the wonderful aroma of roasted pumpkin seeds (also called pepitas). I almost enjoyed snacking on the pumpkin seeds better than all of the candy I got for Halloween. Who am I kidding? Not really, but close! I found this particular recipe on the Good Housekeeping website. For those of us who are on the Weight Watchers Points Plus Plan, 1/4 cup serving of these roasted pumpkin seeds = 6 points plus. Scoop out the inside of a medium size pumpkin into a colander. Run cold water over the seeds and discard the pulp and strings. Drain seeds well and dry (I spread them out on a cookie sheet and let them dry out for 24 hours). Toss the seeds with the oil. Spread the seeds out in a single layer onto a cookie sheet. Bake at 375° F until toasted for approximately 30 minutes. Check and stir every 10 minutes. Mmmmm! They turned out really good!! But, I would have baked them probably another 30 minutes if I had more time. I like them extra crispy, almost burnt. You just need to make sure that you’re home long enough to keep checking them and patient enough to bake the heck out of them. You can also season your pumpkin seeds with chili powder to make them spicy, cumin and salt, cinnamon sugar, or garlic salt. One quarter cup of roasted pumpkin seeds contains 169 calories and 4.34 g of carbohydrates. They serve as a good, vegetarian source of protein with 8.8 g, or about 16 percent of a day’s worth. 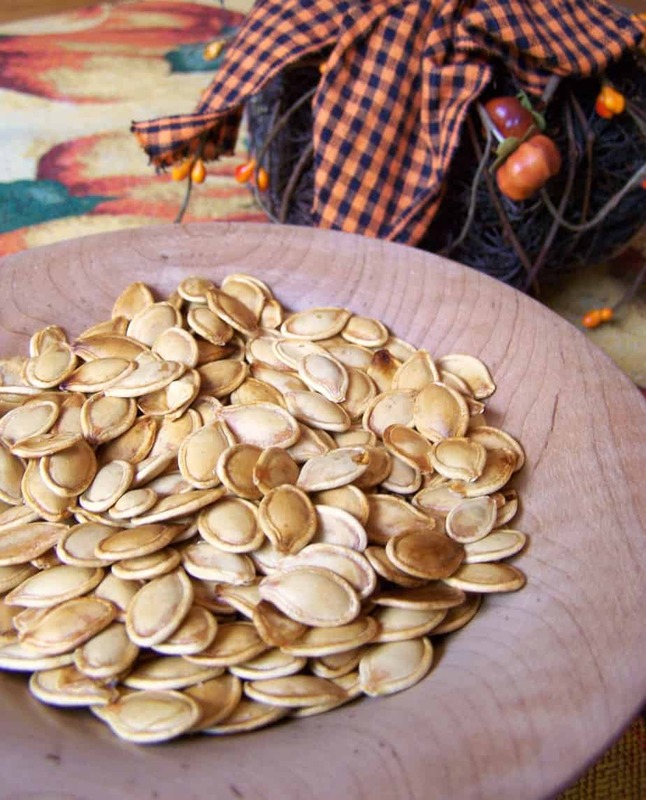 Fiber in pumpkin seeds comes in at almost 2 g per 1/4-cup serving. 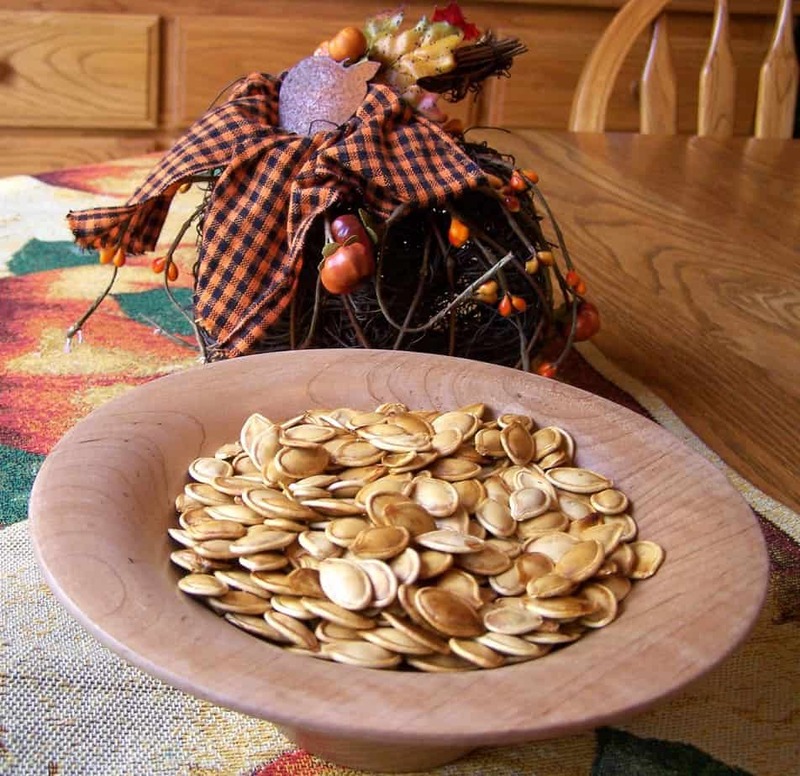 Most of the 14.47 g of fat in an ounce of pumpkin seeds is the heart-healthy unsaturated variety. In ¼ cup there are 4.64 g of monounsaturated fats and 5.86 g of polyunsaturated fats. The American Heart Association notes that choosing foods high in unsaturated fats in lieu of those high in saturated and trans fats can have positive effects on cholesterol levels and overall health. 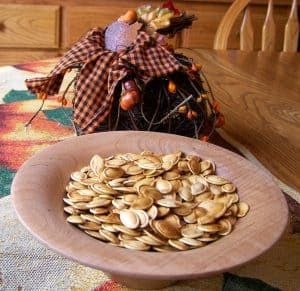 One quarter cup of pumpkin seeds provides 46 percent of the daily recommended value for magnesium, 29 percent of iron, 52 percent of manganese and 24 percent of copper. 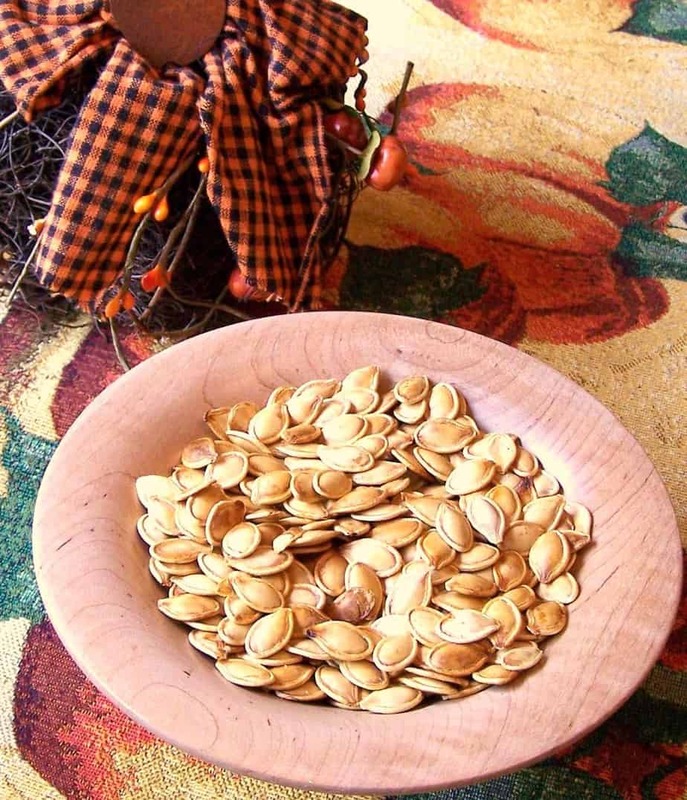 Pumpkin seeds also are a good source of zinc, with 17 percent of the daily recommended value. Pumpkin seeds are high in phytosterols, compounds that might help reduce cholesterol levels, enhance immunity and decrease the risk of developing certain cancers, says The World’s Healthiest Foods website. 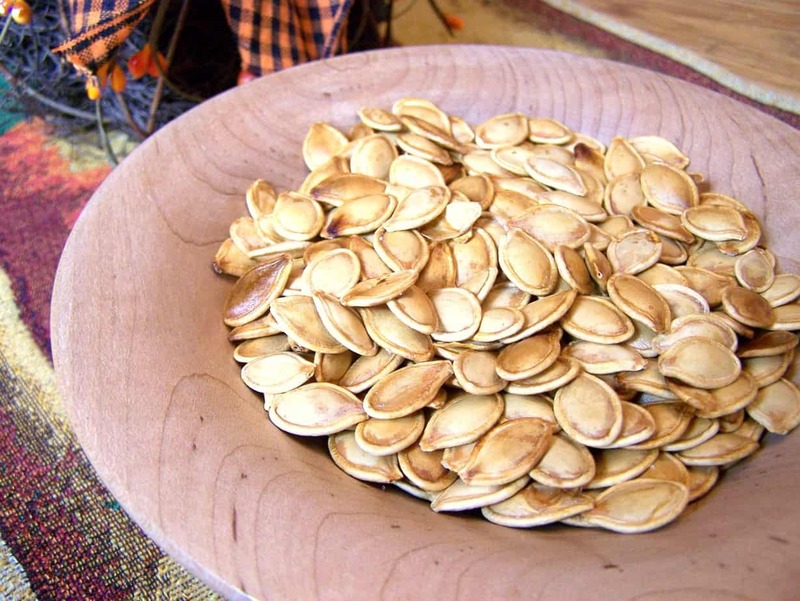 In a study in the “Journal of Agricultural and Food Chemistry” in 2005, researchers from Virginia Polytechnic Institute and State University listed the phytosterol content of pumpkin seeds at 265 mg per 100 g, close to the amounts found in sunflower seeds and pistachio nuts. So, as you can see, you really can’t go wrong with good old pumpkin seeds. Start your own Halloween tradition and roast your own while the kids are suiting up for trick-or-treating. Thanks for sharing my 12 year old daughter has been looking forward to carving our pumpkin and roasting the seeds. Yummy! Aw, that’s great Lisa! So glad I could share our tradition with you.